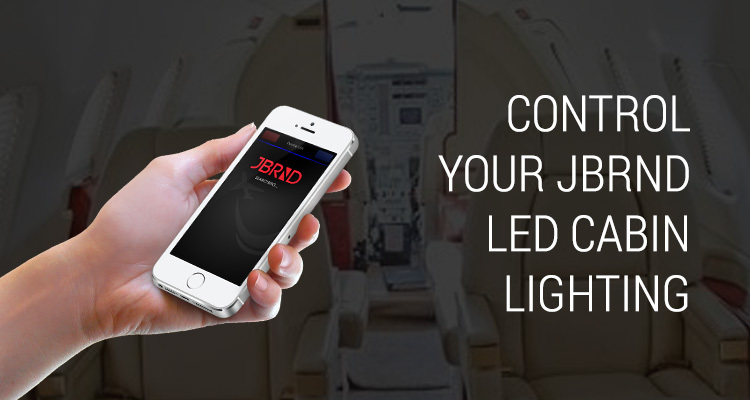 Flight Lights is the JBRND app for iOS and Android, used to control JBRND LED Lighting on aircraft. Packed with features, Flight Lights has the ability to perform Dimming, White Temperature Adjusting, RGB, and RGBW control all in one. Each section of the aircraft’s lighting can be individually labeled with a title and a corresponding image. It also has the ability to save Scenes that run customize able programs for different lighting fades and transitions. Scenes gives a user the ability to customize the lighting of the aircraft for scenes such as “Aircraft Boarding” or “Night Mode” with one touch of the button. 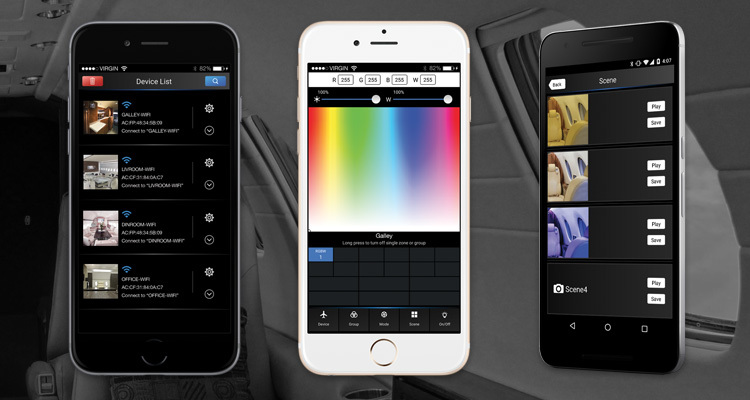 The app is already preloaded with number of preset modes to use as well for viewing different lighting effects. JBRND’s lighting system can be installed on any aircraft, big or small, and has passed critical DO 160 testing requirements. JBRND’s Flight Lights app is available for free on the App Store for iOS devices such as iPhone and iPad, and on the Google Play Store for Android devices. Already have our lights? It’s time to brighten up that aircraft. Download below. 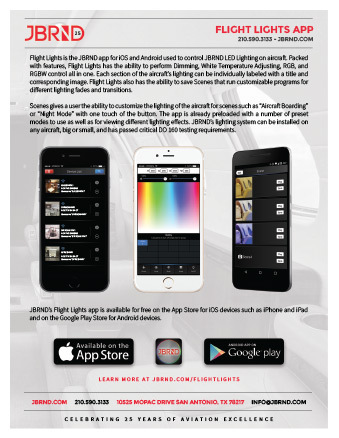 Get the JBRND brochure for our Flight Lights app. The brochure is one page, in PDF format, ready for printing. If you are interested in any other JBRND brochures, make sure to visit our Downloads Section, where there are many others available. As always, just get in touch if you have questions. For more information about JBRND's Flight Lights App, contact us. We look forward to discussing your project. Get in touch with us today to get more information by clicking the button below.